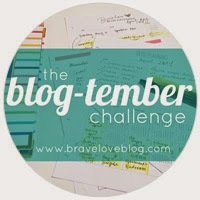 Today's Blogtember prompt is about relationships. Very fitting because YESTERDAY marked 7 years of togetherness with my love. 7 years. It's so hard to believe he has been in my life that long. And married for almost 6! Time flies, but of course we all know that. I thought in honor of that day, I'd share our little story of how we came to be a couple. 7 years ago, I was entering my junior year in college, and he was going to be a sophomore. We had gone to college together the previous year, even living in the same dorm, just a few floors apart, but didn't know each other at all. Even though it was a very small, private school, we just hadn't crossed paths. We didn't have any friends in common, weren't in the same activities and didn't have any classes together. We first met in the spring, right before school let out for summer. 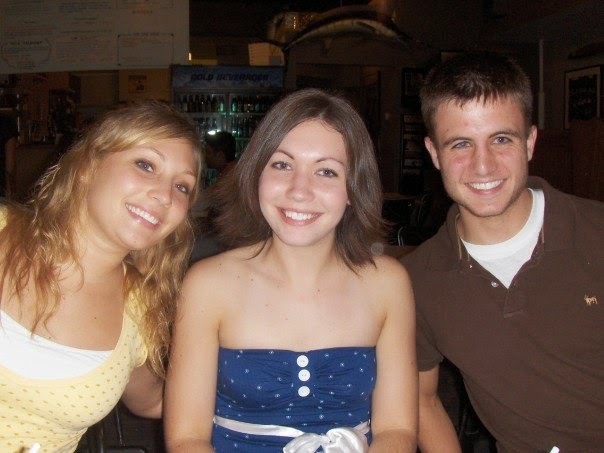 We had both applied to be Resident Assistants (RAs) for the 2007/08 school year. We both got the job and were assigned to the same (even smaller) dorm. We met at our very first 'get to know you' meeting in the spring. We had to do a few activities together since we were in the same dorm, and there were just 4 of us in that building so we were forced to talk to each other. I thought he was really funny but that was about it. I was a pretty new Christian and was really focused on that, and not looking for a relationship at the time. He had a girlfriend anyway, which I didn't know at the time. Well, we sat down to write letters to our residents and I kept feeling like there were eyes on my paper. Finally I looked up, and he was totally copying my letter! Such a dork. So that was where we first met. I think we became Facebook friends after that and we went our separate ways for the summer. In the fall, we had to come back to school several weeks before anyone else for RA training. That was seriously probably one of the funnest few weeks of my life. We all got to know each other so well and everyone became fast friends. We were together from sun up to sun down every day for 2 weeks straight. One of the first nights, a bunch of us were looking for a place to sleep because our dorms weren't air conditioned and it was the beginning of August in the midwest which = 100 degrees and 95% humidity. We just could not get to sleep in the heat. Someone mentioned that T had the code to get into the honors lounge which was air conditioned but no one could get a hold of him. His friend finally did and said he was having girlfriend problems so he would not be around that night. I felt bad for him, but again, that was about it. We all went on training to be RAs all day, and hanging out all night. One night, he, his room mate, another one of his friends, me, and a friend of mine were all watching a movie. It must have been a Saturday night because I got a text from a friend of mine suggesting that I invite all the RAs to church in the morning. I asked everyone who was in the room and the general consensus was either that they were a) Catholic so they had mass to attend at the Chapel. b) they had another church they went to in town. Or c) they were uninterested. Then it came back to him, who hadn't said anything. So I said "what about you? Do you want to go to church in the morning?" His only response was "um, no." I pushed it for a minute, just kind of teasing him and encouraging him to come, but it was obviously very uncomfortable for him, so I dropped it pretty quickly. My friend left, and the others with us got really into the movie, but we started talking. He was talking about his girlfriend and a bunch of stuff that had happened between them that summer (well, she wasn't really his girlfriend at the time...they were kind of determining what their status was), and I just felt so bad for him. Somewhere along the way, it had started to get late so he offered to walk me up to my room. On the way up we got to talking more and just couldn't stop. I had been through a break up of a several year long relationship the year before, so I had some insight to offer him and he seemed to really want it. He was really confused about what to do and other things. One thing that we talked a lot about was how for me, during the hard break up season, a lot of prayer, knowing that God had a better plan for me, etc. was what really got me through it. He quickly dismissed those thoughts each time, but slowly throughout the night he started to become more receptive. Even though it was probably past midnight, he was wanting to go across town and put flowers on this kinda-sorta-girlfriend's car because she started school the next day. He's ridiculously sweet like that. I suggested to him that because of the way he had been treated all summer, and was still being treated, maybe that would be something to hold off on. Maybe there was something better out there for him. I still had no romantic feelings for him at this point. He was obviously not in a good place relationship wise, and what was bigger for me is that he was obviously not a Christian and didn't want anything to do with it. Finally, sometime late late late that night, he agreed to at least try church. To see what it was like and see if it was something that interested him. I am pretty sure that we stayed up until at least 4 a.m. talking. I remember when he was leaving I awkwardly said "I kinda feel like we should hug". Lol! I am not the huggy type at all, but this guy had just poured out his heart to me for the last 6 hours! He laughed, and we hugged and made plans to meet up for church in a few short hours. I'm not 100% sure, but I think that that was the night he became interested in me. The next day, we went to church in the morning and out to lunch after, before hurrying back for RA training. 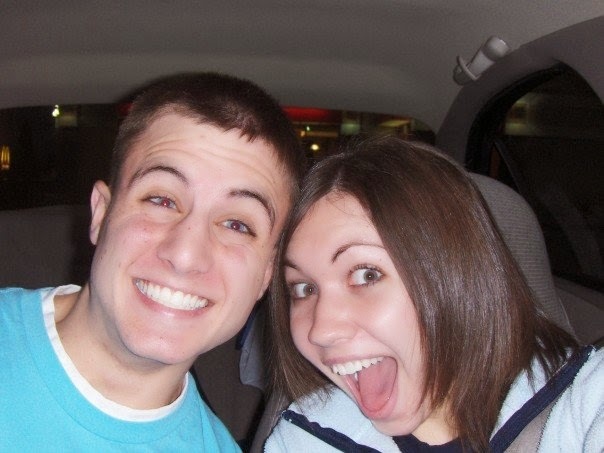 Things after that are kind of a blur, but I am pretty sure we spent just about every waking hour together after that. He had been really interested in the church service and had a lot of questions for me about God. We would talk a lot about that. About who God was, the Bible, prayer, etc. We talked a lot about relationships and just life in general. I was starting to develop feelings for him, but had my guard up so far. I would not let myself start to like him. It was too risky to me. He was in this kinda sorta break up that I really wasn't sure if it would become a full on break up or if they would get back together like the girl wanted. I wasn't sure if his new interest in God was genuine interest, or just fleeing thoughts. I just wouldn't let myself go there. Over the next week we continued spending a lot of time together and he asked to go back to church the next week. I told him that I thought it would be good for him to talk to a Christian guy about some of this stuff. I knew of one guy and that was about it. He was a young married man, who was just a little older than us who went to another college in town. I was friends with his wife, they were pretty new Christians, and I knew he really wanted college aged guys to mentor. I called his wife and she talked to her husband who agreed to meet Sunday after church. We rode to church together, but I left after and someone else planned to take him home. During their meeting, he had a lot of his questions answered, but more importantly, the gospel was explained to him in depth, and he received Christ! The funny thing is, he didn't tell me, or anyone, for about another week. He just kept it to himself like it wasn't a big deal until I told him it was a HUGE deal!!! 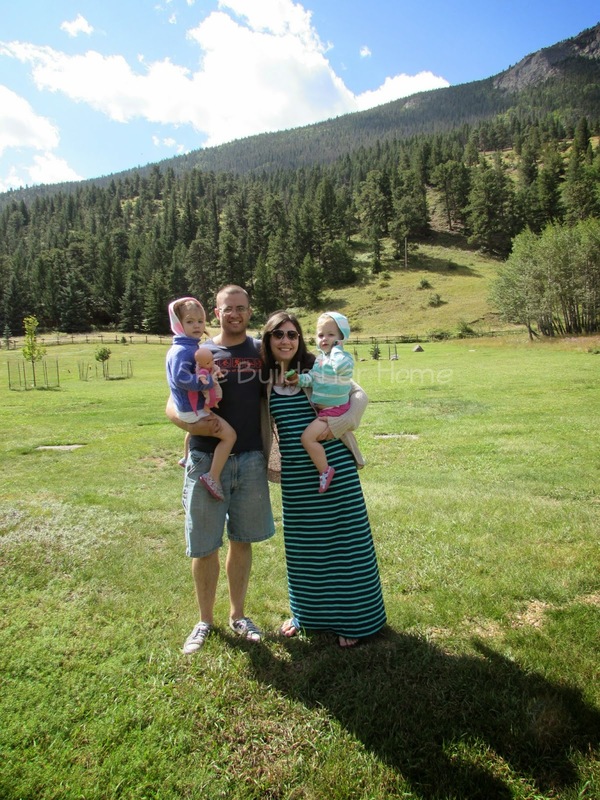 (Back story that doesn't have to do with our relationship: the guy who was mentoring him was a new, married Christian who had a heart to become a pastor. There were NO other guys his age in our church so he had been praying for a long time for God to give him a ministry partner. Well after my husband became a Christian, God put him on a fast track in ministry and grew him up very quickly! 7 years later, These two guys are still best friends, work their day jobs in cubicles right next to each other, and have planted a church together. God is so faithful!) Are you still with me here?! I will wrap it up soon, I promise! We continued spending time together and I think after I learned about his salvation, I started letting my guard down a little. I was still cautious because he was freshly out of a relationship and I just didn't know. But I started to like him. A lot. We continued spending all of our time together and we could talk literally forever and never run out of things to talk about. One night he was up in my room and we were watching a lightning storm together. I was laying on my bed and he was sitting in a chair across the room. I had a whole wall of giant windows in my dorm room so we turned the lights off and were watching the storm and talking. He started telling me this super intense story about a time where some guy chased him and his cousin through town and without going into deals, it was like a movie and he was definitely in harm's way. For some reason with the lightning bright, the thunder pounding and him telling me this terrifying, but very real story, I had this thought pop into my head out of nowhere. This is the guy I'm going to marry. This is my husband. I have NO idea where this came from. It obviously wasn't a romantic story. We weren't even sitting by each other, and I was looking out the window, not at him. We weren't even dating! But that was the moment I knew. He had already fallen madly in love with me, what can I say?! ;) But that was where it clicked for me. I was falling in love with this guy that I wouldn't even allow myself to admit that I liked! The rest is pretty much history. We continued spending all of our waking moments together, until finally on September 12, 2007 he asked me to be his girlfriend. Obviously I said yes and never looked back. We were engaged just a little over 2 months later, and married the next year! When you know, you just know! 7 years, (almost) 3 college degrees, at least 9 cars, 1 apartment, 2 houses, 2 dogs, and 2 beautiful babies later, I still think back to that stormy night, and thank God for helping me see that he was my husband. Ahh I remember like it was yesterday! It's so amazing how God brought you two together!! !